I am fortunate to have been president of the Council on Foreign Relations for a decade now. I am proud of our progress and excited about our future. Though the past ten years have been marked by change and modernization, the traditional mission of CFR endures: to be a resource to help our membership and others better understand the world and the foreign policy challenges facing the United States. We are at our core a membership organization. Since 2003, CFR membership has grown by 15 percent—from 4,100 to just under 4,800— and has become more diversified in gender, ethnicity, professional background, location, and expertise. Term members (individuals elected between the ages of thirty and thirty-six to serve five years) are an even more diverse group, which suggests a positive trajectory for the future of the organization. Economic challenges since 2008 have tested all nonprofits, and CFR is no exception. We have maintained a strong financial position by exercising smart financial management, all the while continuing to grow. The caretakers of CFR’s finances—the Board of Directors’ Investment Subcommittee, and both the Finance and Budget and the Audit committees— have been extraordinary custodians. Over the past ten years, both our budget and our endowment have doubled, and we have developed existing revenue streams and added new ones to keep pace. It takes resources to be a resource, and I and we are grateful to the community of members, corporations, foundations, and others that supports CFR. Foreign Affairs, the preeminent magazine of international affairs and U.S. foreign policy, has evolved both in its look and in the range of authors it publishes and topics it covers. Under the able leadership of Editor Gideon Rose, Publisher Lynda Hammes, and their predecessors, James F. Hoge Jr. and David Kellogg, the magazine is reaching new audiences through a steady stream of digital products available on mobile devices, ereaders, and other platforms. ForeignAffairs.com is a robust, timely source that now publishes more original content than the print edition. The David Rockefeller Studies Program has added more scholar-practitioners with relevant work experience in government, business, nongovernmental organizations, media, and academia. Notable recent additions to the think tank include former U.S. treasury secretary Timothy F. Geithner, former national security adviser Thomas E. Donilon, international economics expert Robert Kahn, and Nobel Prize–winning economist A. Michael Spence. The Global Board of Advisers, a select group of prominent individuals, includes business leaders, noted academics, and former government officials from developed and emerging-market countries. For nearly a century, CFR scholarship has covered traditional foreign policy topics, such as national security, trade, and diplomatic relations, along with the most important and, in many cases, most volatile regions and countries. We continue to study these issues, but we have also expanded our intellectual agenda to address matters such as child marriage; girls’ education; cybersecurity; the domestic underpinnings of U.S. power, including debt and deficits, immigration, infrastructure, and education; global health, including noncommunicable diseases; and much more. As our Board co-chairs address in their accompanying essay, the intellectual output of the David Rockefeller Studies Program is exceptional. Over the past ten years, the think tank and its fellows have published more than one hundred books, three hundred reports, and more than four thousand op-eds and articles. And in recent years, they have embraced the full range of new media. Fellows provide real-time analysis on CFR.org’s topical blogs and through their Twitter feeds, offer expert commentary to award-winning interactive Crisis Guides, and participate in the Ask CFR Experts question-and-answer series. The CFR-sponsored Independent Task Force Program has overseen the release of twenty reports in the past decade, on matters ranging from terrorism and climate change to immigration policy and trade. The most recent, Defending an Open, Global, Secure, and Resilient Internet, focused on Internet governance, cybersecurity, and the free flow of information. We strive to be creative and innovative in what we do. Two years ago, we launched the Council of Councils, a unique international network connecting leading foreign policy institutes from around the world in a discussion of issues concerning global governance and multilateral cooperation. Roughly tracking the membership of the G20, the Council of Councils is intended to foster high-level, candid dialogue among policy experts from established and emerging nations through regional conferences, augmented by year-round videoconferencing and online exchanges. We also created the Global Board of Advisers (GBA), a select group of prominent individuals, including business leaders, noted academics, and former government officials from developed and emerging-market countries. Led by CFR Board Vice Chairman David M. Rubenstein, the aim of the GBA is to strengthen our understanding of international perspectives while also enhancing the dialogue between U.S. leaders and their counterparts in other countries. CFR’s role as a truly nonpartisan, independent think tank with a broad intellectual agenda is more valuable than ever. The Council’s website, CFR.org, has evolved to be the preeminent resource for analysis of and information on U.S. foreign policy and America’s role in the world. The site publishes large amounts of original content, but also includes curated material from authoritative sources and voices from around the United States and the world. We have explored new mediums, including interactive maps, infographics, videos, and award-winning multimedia guides. To connect with interested citizens whose voices are increasingly important to the foreign policy debate, we have actively engaged students, teachers, religious and congregational leaders, and state and local officials with programming and material tailored to their interests and concerns. In the coming years, we will be ramping up our work in education with an enhanced online destination for students, teachers, and professors. As important as it is to broaden CFR’s reach, it is also essential that we focus on our impact on U.S. foreign policy decision-making. We are shaping not only the debate, but also the country’s future leadership and policy agenda. To that end, CFR is a training ground for the next generation of foreign policy leaders through its international affairs fellowships, military fellowships, and programs for other visiting fellows. These fellowships offer professional development that individuals would not have access to otherwise, and participants find their experiences highly formative. Former U.S. ambassador to NATO Ivo H. Daalder has described his time at CFR as “a career-changing experience.” Fellows have had invaluable experiences in government and academia in the United States, Japan, South Korea, and India, while roughly one-third of CFR’s visiting military fellows go on to be admirals or generals. As an organization, we also strive to be environmentally and socially conscious. Completed five years ago, our LEED Gold–certified office building in Washington, DC, is just steps from the White House and has transformed the organization’s presence in our nation’s capital. In addition to investments in our infrastructure, we are also investing in the well-being of CFR employees, our human capital. We have promoted an active lifestyle for our staff by establishing a health and wellness program that has lowered health-care costs, reduced absenteeism, and fostered a healthier workforce. Although these accomplishments are considerable, we cannot rest on our laurels. The marketplace of ideas is increasingly competitive. In today’s era of narrowcasting and partisanship, CFR’s role as a truly nonpartisan, independent think tank with a broad intellectual agenda is more valuable than ever. We have many reasons to be confident in the Council’s future. CFR’s reputation as a trusted, authoritative resource on U.S. foreign policy endures. I am proud of what this institution has achieved over the past ten years, and I look forward to helping to lead the Council on Foreign Relations in the years ahead. I want to thank Co-Chairs Carla A. Hills and Robert E. Rubin, as well as their predecessor Peter G. Peterson, and mine, Leslie H. Gelb, for their many contributions. I also thank Vice Chairs David M. Rubenstein and Richard E. Salomon, and all of the members of the Board of Directors, for their service and dedication to this institution year in and year out. Moreover, all that we have accomplished over the past decade would not be possible without the extraordinary hard work of CFR staff in New York and Washington, DC, for which I am most grateful. One of CFR’s main functions is to provide a nonpartisan forum for informed foreign policy debate, convening meetings where senior government officials, members of Congress, global leaders, and prominent thinkers come together with CFR members to discuss and debate major international issues. This year, more than two hundred general meetings were convened in New York and Washington, DC. The programming year opened on the eve of the U.S. presidential election, and CFR hosted representatives from both campaigns to discuss the foreign policy challenges facing the candidates. CFR also welcomed international and domestic observers, including the U.S. and Washington bureau chiefs of several leading foreign news agencies, to comment on the potential implications of the candidates’ policies abroad. 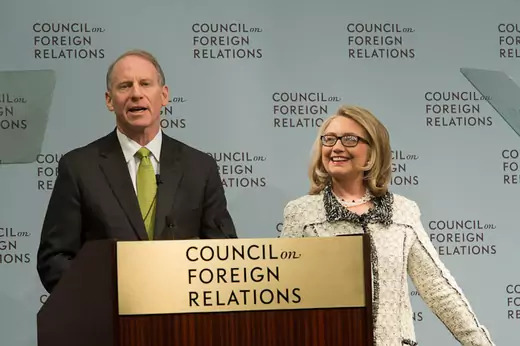 President Richard N. Haass introduces Hillary Rodham Clinton at CFR in Washington, DC, at the end of January. Clinton delivered her final remarks as U.S. secretary of state. As is the case nearly every year, the UN General Assembly brought dignitaries from across the world to New York City and to CFR. In the midst of continued upheavals in the greater Middle East, members met with interim Tunisian president Moncef Marzouki, King Abdullah II of Jordan, interim Libyan president Mohammed Magariaf, Pakistani foreign minister Hina Rabbani Khar, and Iranian foreign minister Ali Akbar Salehi. That same week, Polish president Bronislaw Komorowski, Italian prime minister Mario Monti, Liberian president Ellen Johnson Sirleaf, Mexican president Felipe Calderón, and Nobel Peace Prizewinner and Burmese opposition leader Aung San Suu Kyi also met with members in New York and Washington, DC. Leaders from international organizations, including NATO secretary-general Anders Fogh Rasmussen and International Criminal Court prosecutor Fatou Bensouda, came to CFR as well. Other dignitaries to visit CFR during the programming year included Crown Prince of Bahrain Salman bin Hamad al-Khalifa, Icelandic president Ólafur Grímsson, Canadian prime minister Stephen Harper, Australian prime minister Kevin Rudd, and German finance minister Wolfgang Schäuble. CFR welcomed influential international officials throughout the year, including UN secretary-general Ban Ki-moon, who delivered the Sorensen Distinguished Lecture on the challenges and responsibilities facing the international community, and UN Development Program administrator Helen Clark, who discussed the agency’s 2013 Human Development Report. Global thought leaders, including Grameen Bank managing director and CEO Muhammad Yunus, who delivered the David A. Morse Lecture, also addressed the membership. U.S. officials, including former secretary of state, treasury, and labor George P. Shultz, came to CFR to offer their insights on world events. Thomas Frieden, director of the Centers for Disease Control and Prevention, spoke about the threat posed by noncommunicable diseases, and the military service chiefs convened for the Robert McKeon Endowed Series on Military Strategy and Leadership. In Washington, Hillary Rodham Clinton delivered her final public remarks as secretary of state. Following the 2012 election, CFR launched a meeting series, the Presidential Inbox, to address the major issues confronting the Obama administration in the president’s second term. An ongoing special meeting series, HBO History Makers, which focuses on the contributions of a prominent individual, featured former secretary of state Madeleine K. Albright, former special envoy for Middle East peace George Mitchell, and former chairman of the Federal Reserve Paul A. Volcker. The Lessons Learned series featured speakers, including former ambassadors Thomas R. Pickering and Frank G. Wisner and American Express CEO Kenneth I. Chenault, who reflected on critical moments in their careers in meetings with term and younger life members. Examining issues ranging from the eurozone crisis to U.S. financial regulation, the C. Peter McColough Series on International Economics brings the world’s foremost economic policymakers to CFR. Featured speakers included director general of the Italian treasury Vittorio Grilli, former U.S. secretary of the treasury Lawrence H. Summers, and Jeremy C. Stein, professor of mathematics and member of the board of governors of the Federal Reserve. 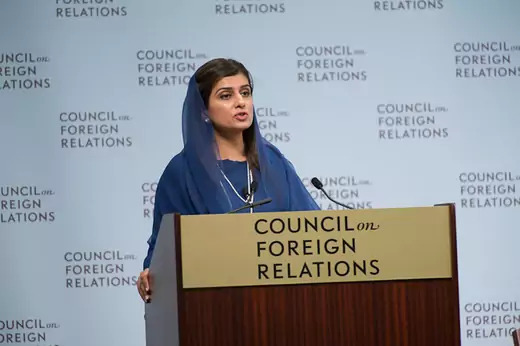 Hina Rabbani Khar, minister of foreign affairs, Islamic Republic of Pakistan. Meetings in the World Economic Update series featured economists from federal agencies, the U.S. Treasury, banks, and public corporations, with discussions moderated by Sebastian Mallaby, Paul A. Volcker senior fellow for international economics and director of the Maurice R. Greenberg Center for Geoeconomic Studies. In addition to its general meetings and meetings series, CFR was pleased to cohost a symposium with Conservation International this year on ties between economic and security interests and global resource scarcities. The event convened intelligence officials, development economists, defense experts, conservation biologists, and corporate executives. Every two years, the Congress and U.S. Foreign Policy program hosts a Congressional Staff Conference designed to inform the debate on Capitol Hill and position CFR as an essential resource and forum for incoming lawmakers and their staffs. The nearly one hundred participants in the 2013 conference ranged from legislative assistants working for newly elected representatives to senior committee staff members and leadership. Throughout the year, the Congress and U.S. Foreign Policy program holds weekly roundtables with senior foreign policy aides, as well as sessions that connect new members of Congress with CFR experts for discussion of issues chosen by legislators. 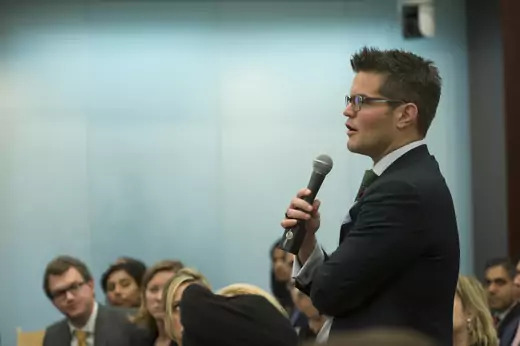 The Stephen M. Kellen Term Member Program invites promising young leaders in their thirties to interact with seasoned foreign policy experts through programming designed specifically for them. This year, term members, who are elected for a five-year period, participated in excursions to the World Bank, ABC News, the New York City Police Department, and Fort Benning, Georgia, as well as a longer trip through Brazil. More than three hundred term members from around the country and the world met at their annual conference for sessions with former national security adviser Zbigniew Brzezinski and CFR President Richard N. Haass on foreign policy issues facing the Obama administration; with former U.S. ambassador to Afghanistan and Iraq Ryan C. Crocker on the Arab uprisings; and on the U.S. policy pivot toward Asia. The term members also participated in a team debate on the future of U.S. primacy. CFR sponsored one Independent Task Force report this year, Defending an Open, Global, Secure, and Resilient Internet, which was chaired by John D. Negroponte, former deputy secretary of state and director of national intelligence, and Samuel J. Palmisano, former chairman of the board and chief executive officer of IBM. It was directed by Adam Segal, CFR’s Maurice R. Greenberg senior fellow for China studies. The Task Force report, endorsed by its two dozen members, finds that as more people and services become interconnected and dependent on the Internet, societies are becoming increasingly vulnerable to cyberattacks. To support security, innovation, growth, and the free flow of information, the Task Force recommends that the United States and its partners work to build a cyber alliance, make the free flow of information a part of all future trade agreements, and articulate an inclusive and robust vision of Internet governance. Programming for National members—the more than one-third of CFR members who live outside of New York and Washington, DC—includes on-the-ground events, livestreaming and teleconferences of CFR meetings, and the annual National Conference in June. The National Conference, underwritten by a grant in memory of Peter E. Haas from the Mimi and Peter Haas Fund, drew members from thirty-eight states and nine countries this year. Conference highlights included sessions with Secretary of Homeland Security Janet Napolitano, Assistant to the President for Homeland Security and Counterterrorism Lisa O. Monaco, and a dinner program at the American Museum of Natural History on presidential leadership featuring CFR Board members Tom Brokaw and Joseph S. Nye Jr. Other plenary topics included U.S. digital policy, American grand strategy, the global economy, China, and immigration policy. Eighteen breakout sessions covered regions around the globe and topics as diverse as climate change and currency wars, while Saturday town hall sessions focused on the future of U.S. energy and the changing nature of warfare. The Corporate Program celebrated its sixtieth anniversary this year. Founded in 1953 with 25 corporate members, the program has since expanded to include approximately 170 companies from various sectors and regions of the world. Seven of the original corporate member companies, including Exxon Mobil and JPMorgan Chase & Co., remain active participants in the program. This year, several member companies increased their support of CFR and upgraded to higher corporate membership tiers: PepsiCo, Inc., to the Founders level, our highest corporate member tier; and the Coca- Cola Company, Deutsche Bank AG, and DynCorp International to the President’s Circle level. We also welcomed the following new members: Bennett Jones LLP; Cigna; Depository Trust & Clearing Corporation (DTCC); Edelman; Expedia, Inc.; Northern Trust; NRG Energy; Palantir Technologies; salesforce.com, inc.; Western Union; White & Case LLP; WPP; and Zurich. Headliners for this year’s CEO Speaker series were Jim McNerney of the Boeing Company, Jamie Dimon of JPMorgan Chase & Co., Ray Dalio of Bridgewater Associates, John S. Watson of Chevron Corporation, Michael Duke of Walmart, and CFR Board member Muhtar Kent of the Coca-Cola Company. The tenth annual Corporate Conference featured Evercore Partners founder and executive chairman Roger C. Altman, former U.S. secretary of state Henry A. Kissinger, IBM chairman and chief executive officer Ginni Rometty, and CFR Vice Chairman and Carlyle Group cofounder and co-chief executive officer David M. Rubenstein, among others. More than three hundred executives from nearly one hundred corporate member companies attended the conference. CFR is committed to forging connections with an array of constituencies, particularly those whose voices are increasingly important to the foreign policy debate: educators and students, religious and congregational leaders, and state and local officials and their staffs. Among other activities, the Outreach program hosts events and teleconferences for these communities and provides access to CFR resources on topics of interest, including publications and live-streamed meetings. The 2012 Religion and Foreign Policy Summer Workshop was a highlight of Outreach programming. Rabbi Elliot Cosgrove of the Park Avenue Synagogue gave a moving invocation, and this year’s workshop had the highest attendance to date, with 125 participants representing more than 22 denominations. A term member speaks at the seventeenth annual Term Member Conference, held at CFR’s office in Washington, DC, on November 8 and 9. The Academic Initiative, which seeks to introduce university and high school educators and students to CFR resources and to foster relationships between CFR and the academic community, continues to grow thanks to the generous support of CFR Vice Chairman David M. Rubenstein. This year, the Academic Initiative’s Back-to-School Event offered students the opportunity to meet CFR scholars and explore employment opportunities at the organization. CFR reached professors working in fields related to foreign policy and international affairs through the College and University Educators Workshop, where professors gave feedback on CFR’s classroom resources and heard substantive briefings from CFR experts. The High School Educators Workshop introduced secondary school teachers to CFR resources useful for research and in preparing lesson plans. CFR also hosted college and university presidents for the Higher Education Working Group, a forum through which these professionals, joined by select foundation heads, explore the role of institutions of higher learning in meeting challenges posed by global issues. The group convened in March for briefings on global governance, energy security, and the politics and economics of the Middle East and Asia. Lastly, CFR continued to strengthen its partnership with the National Forensic League debate society, whose 120,000 high school participants regularly cite CFR resources in their competitions. CFR continues to embrace new technologies and multimedia as a way to communicate with its members and an increasingly international audience. In 2013, public meetings began streaming on YouTube, increasing the reach of CFR’s on-the-record events, including a meeting sponsored by the Corporate Program and featuring Bridgewater Associates founder Ray Dalio, which has been viewed more than one hundred thousand times. The institution also launched a free iPhone app, which offers timely posts from more than a dozen expert blogs, daily briefs on world events, breaking analysis from the think tank, and videos and transcripts of CFR events—all in a mobile-ready format. CFR.org’s editorial team introduced video issue primers this year. The first in the series featured Senior Fellow for Latin America Studies Shannon K. O’Neil and Senior Fellow and Director of the International Institutions and Global Governance Program Stewart M. Patrick on Mexico’s drug war; it has been viewed nearly thirty thousand times on YouTube since its release. Another video series, Three Things to Know, breaks down complex issues to their most important components in less than four minutes. Recent topics include child marriage, sequestration, and potential intervention in Syria. CFR.org also launched a new daily feature to increase interaction with the public. Ask CFR Experts invites visitors to the website to submit questions to the think tank. Responses are featured on the homepage and shared through social media. Earlier in the year, CFR.org covered the foreign policy dimensions of the presidential election with a blog, Campaign 2012, and an accompanying series of Issue Trackers, features that were among the most viewed on the website in 2012.